From the Royal Opera House, Covent Garden, a performance of Donizetti's Lucia di Lammermoor, with Diana Damrau as the tragic Lucia and Charles Castronovo as Edgardo. Donizetti's tragic masterpiece Lucia di Lammermoor from the Royal Opera House, Covent Garden, with Diana Damrau as the innocent Lucia who is forced into a marriage with Arturo Bucklaw by her brother Enrico to save the family fortunes, although Lucia is desperately in love with Edgardo Ravenswood. Enrico's ruthlessness and deceit devastate his fragile sister Lucia, with tragic consequences. German soprano Diana Damrau stars as Lucia, with Ludovic Tézier as her determined brother Enrico, and Charles Castronovo as her doomed lover Edgardo. Daniel Oren conducts the Chorus and Orchestra of the Royal Opera House, Covent Garden, in the recent new production by Katie Mitchell. Christopher Cook presents this performance with commentary from Italian opera specialist Flora Willson. Singer: Diana Damrau. Singer: Ludovic Tézier. Singer: Charles Castronovo. Singer: Taylor Stayton. Singer: Peter Hoare. Singer: Rachael Lloyd. Singer: Kwangchul Youn. Choir: Coro del Teatro dell’Opera di Roma. Orchestra: Orchestra of the Royal Opera House, Covent Garden. Conductor: Daniel Oren. Singer: Diana Damrau. Singer: Ludovic Tézier. Singer: Charles Castronovo. Singer: Taylor Stayton. Singer: Rachael Lloyd. Singer: Kwangchul Youn. Singer: Peter Hoare. Choir: Coro del Teatro dell’Opera di Roma. 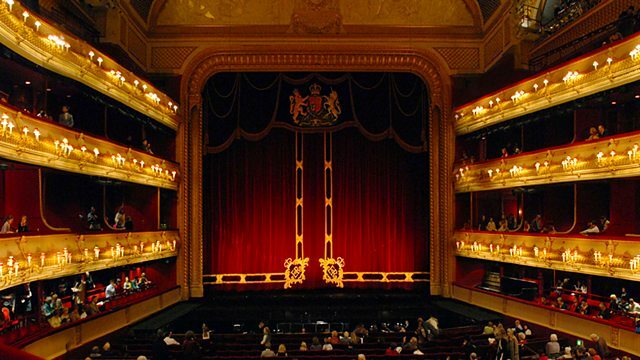 Orchestra: Orchestra of the Royal Opera House, Covent Garden. Conductor: Daniel Oren. Conductor: Diana Damrau. Singer: Ludovic Tézier. Singer: Charles Castronovo. Singer: Taylor Stayton. Singer: Peter Hoare. Singer: Rachael Lloyd. Singer: Kwangchul Youn. Choir: Coro del Teatro dell’Opera di Roma. Orchestra: Orchestra of the Royal Opera House, Covent Garden. Conductor: Daniel Oren. A Debussy Recital: Pascal Roge. Normanno and other men have spotted an intruder, and search for him (Per correte le spiagge vicine). Enrico explains to Normanno that his family fortunes are in jeopardy: to recoup them, he needs to persuade his sister Lucia to marry Arturo Bucklaw, a wealthy local gentleman. Enrico’s chaplain Raimondo Bidebent reminds his master that Lucia has no desire to marry, and is still mourning the death of their mother. Normanno hints that in fact Lucia loves Edgardo Ravenswood, a penniless nobleman who saved her from being attacked by a bull. Enrico, who hates Edgardo, is furious (Cruda, funesta smania) and vows to destroy his enemy (La pietade in suo favore). Lucia, in disguise, is waiting for Edgardo. She tells her maid and companion Alisa that she has recently seen the ghost of a Lammermoor girl murdered by one of Edgardo’s ancestors (Regnava nel silenzio). Alisa suspects that this is an ill omen and urges Lucia to end her relationship with Edgardo, but Lucia’s love is too strong for this (Quando rapito in estasi). Edgardo arrives, and tells Lucia that he will depart the next day. He wants to get Enrico’s permission for him to marry Lucia before he leaves. Lucia, worried about her brother’s ferocious temper, forbids him to do this. Instead, the lovers exchange rings and swear to be faithful. Lucia asks Edgardo to write to her while he is away (Verranno a te sull’aure). Normanno has intercepted Edgardo’s letters to Lucia, and forged one to say that Edgardo now loves another woman. Enrico hopes this will make Lucia accept Arturo Bucklaw. Lucia informs Enrico that his cruel behaviour has made her very upset (Il pallor funesto). She refuses to marry Arturo, and tells Enrico that she considers herself Edgardo’s wife. Enrico hands her the forged letter. Lucia is devastated, and Enrico and Raimondo pressurize her to accept Arturo’s offer; Raimondo tells Lucia that her exchange of rings with Edgardo had no legal validity, and urges her to remember her family duty, particularly her obligation to her dead mother (Ah! cedi, cedi). Lucia at last agrees to go ahead with the marriage to Arturo, and Raimondo reassures her that Heaven will reward her. The wedding guests welcome Arturo as Lucia’s bridegroom, and he promises to restore the Ashton family fortunes. Enrico warns Arturo that Lucia is still grieving for their dead mother, and may appear upset. When Lucia arrives, Enrico forces her to sign the marriage contract. As she does so, Edgardo bursts in. Everyone is shocked (Chi mi frena in tal momento). Edgardo threatens Arturo and Enrico, and is only prevented from fighting them by Raimondo, who shows Edgardo the marriage contract. When Edgardo realizes that Lucia has married Arturo, he tears his ring from her finger and curses her. Lucia despairs. Edgardo waits for Enrico. When he arrives, Enrico taunts his enemy about Lucia’s marriage (Qui del padre ancor respira) and challenges Edgardo to a duel the following day at dawn. The festivities for Lucia’s wedding (D’immenso giubilo) end abruptly when Raimondo announces that Lucia is mentally unstable and has murdered Arturo. Lucia, confused after killing her husband, believes that she is about to marry Edgardo; she recalls their earlier meetings and her encounter with the ghost of her ancestor, and prepares for her wedding ceremony (Il dolce suono… Ardon gl’incensi). When Enrico sees her, he is initially furious, but when he hears his sister declare herself the victim of his cruelty, he is filled with remorse. Lucia tells Edgardo (who she believes to be present) that she is dying, and will wait for him in Heaven. Edgardo, who still believes that Lucia has betrayed him, reflects bitterly on her marriage, and longs for death (Tombe degli avi miei… Fra poco a me ricovero). Guests leaving Lucia’s home inform him that Lucia is dying, and has asked to see him. However, it is too late – Raimondo arrives to tell Edgardo that Lucia has died. Edgardo determines to join her (Tu che a Dio spiegasti l’ali), and, despite Raimondo’s attempts to restrain him, takes his own life. - With thanks to the Royal Opera House.